If you saw my post last week about the Cricut BrightPad, you no doubt know just how amazing this crafting tool is but for today’s post, I wanted to share something a little bit different. This post is going to show you just how creative you can get with just the BrightPad on its own. 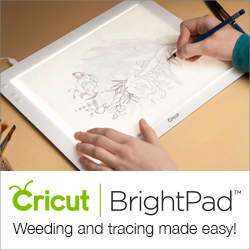 You can use the BrightPad for so much more than just weeding. In this post, I am going to show you how I made a cute cow watercolour painting with the help of my BrightPad. Let me start of by saying, I have always been envious of people who can draw and it’s one skill that I wish I had. Imaging being able to sit down and illustrate anything that pops into your head. Unfortunately, I am good at many things, but not that. With the help of my BrightPad, I was able to print out a picture from the internet and then trace it onto a canvas. You can totally do this, too! It’s so easy. I am not even going to type out the steps to do it because all it takes it finding a picture you like, printing it out, setting up your BrightPad and then you just start tracing! I will however give you a few pointers from what I learned. For starters, I headed to Google to find an image that I liked. I found this sketch of a cow and I saved it to my computer. I wanted the cow to be a little more pretty, so next, I found an image of some flowers. I found this image on a really cool site called PNG tree. This is a really great site and I explain more about it in this post here. For my project, I used a larger canvas and because you can only print on 8×11 sheet of paper, I cropped my cow image and printed it out on two different sheets so it would be larger. Once my designs were printed out, it was time to start tracing! I plugged in my BrightPad (which by the way, as a nice long cord making this tool super easy and convenient) and powered it on. I have to say that this was probably the most relaxing and easy craft, I have done to date. It was just like doodling. All I had to do was place my image on the BrightPad, place my piece of canvas over top and then start tracing. You will notice that I removed the wood frame from my canvas for the reasoning that I will be doing a reverse canvas for this project. You can leave the wood frame on, but it is easier to trace without it. Once, I had finished tracing the entire portion of this cropped image, I added in the top part of the image to trace making sure that it was lined up correctly. If you’re worried about it moving, you can tape it down. The one thing I will say that is very important is because you are using a pencil be very mindful of your hand placement. You will rub the led if you’re not careful. Once I was all done tracing the cow, I placed the image of the flowers underneath the canvas in the position that I wanted and then traced the flowers. Before painting, I went around the pencil with a black Cricut pen. Next time, I do this, I might try not doing the pen. I can’t really decide if I like it or not. When you look at the finished picture, you can let me know what you think! Unfortunately, I don’t have any photos of me doing the painting portion. I don’t know a lot about painting art pieces so all I can say is that I just winged it. I am not lying. I literally just sat down with some paint and started painting and whatever came out, came out. To me, that’s the best kind of art, though. No thought, no rhyme or reason, just expressing yourself. For the frame, all it is is the inside frame that the canvas was wrapped over. I took the canvas off and then painted the frame with Vintage Effect Wash from DecoArt in Grey. And that’s pretty much it, guys! So what do you think? 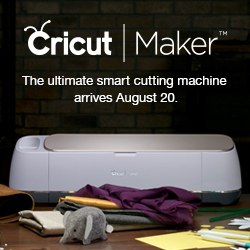 Are you interested in getting a BrightPad from Cricut yet!? I can also tell you that this is just the tip of the iceburg on things that you can use your BrightPad for. What is something you think you could use it for? Share your ideas in the comments below!